Whangarei Suit Hire has an extensive range of suits to suit almost any occasion. Complement your formal attire with our choice of quality accessories. 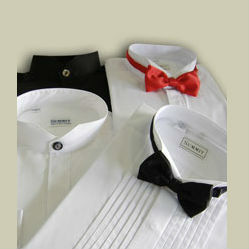 Please take the time to browse our quality range of formal attire. We suggest that you order your suit up to six to eight weeks in advance. Completing the online measurement form on our 'Contact Us' page will help us reserve the correct size for you. Your suit may be collected on the Thursday prior to your event and must be returned by the following Monday. 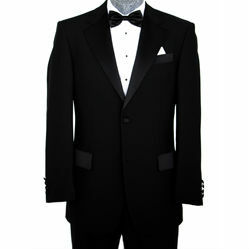 Black Tie / Formal: Dinner suit, wing collar shirt and bow tie. More modern suits are available too. These can also be worn with a waistcoat. School Balls: Formal dress is usually required. Add a touch of colour and personality by wearing waistcoats or bright ties. Ask us about our $99 School Ball Suit Specials now. Wedding Guests: The father of the bride and groom should wear the same standard of dress whether this is a dinner suit with a shirt and bow tie or a lounge suit with a shirt and tie. Measurement Guide: If you are unable to visit our shop, you can email your measurements to us. Please use our Measure Guide to assist.